I know this feels like a complete blogger cliche doing a workout wear wish list in January but here we go anyway. I've been going to the gym regularly since September and after returning to it following Christmas and New Year of course my mind turns to new clothes to keep me motivated. I like my workout wear to be affordable and fun in bright colours and patterns. My nike trainers are a neon orange/pink so while I don't want everything to match I also don't want it to clash either. My current gym leggings come from George at Asda and I love them but I also like options. My workouts consist of cardio and light weights in the gym, zumba, swimming and occasionally yoga. I'd love to work up to being confident enough to run outside during the summer but that is a work in progress. 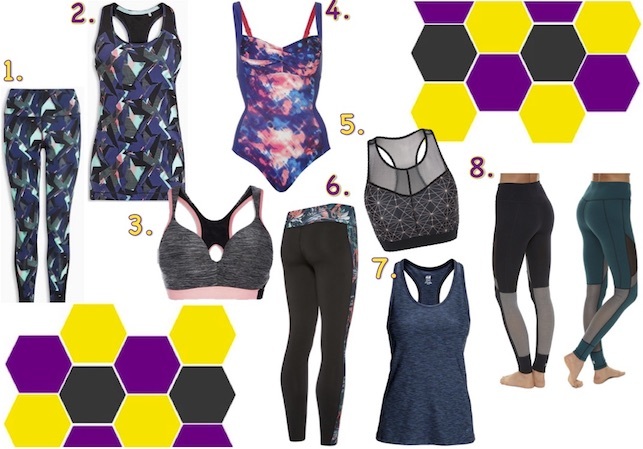 The new Next active wear range was recently brought to my attention and I really like it all. The print on these leggings (1) are perfect so obviously I like the matching top (2) too. I probably wouldn't wear them together though but I'd happily add both to my collection. The sports bra (3) is also from Next and looks practical but cute too. My currently swimming costume is a little too practical for my liking and it wouldn't hurt to have another one would it? Slazenger is a good brand and I really like the colours. The leggings from primark look good and are super affordable. The same goes for the sports bra - I've seen it in store and it looks really supportive while being a cool pattern too. I've been dreaming about this H&M sports top since seeing it in store on Sunday - I think I might have to buy it the next time I'm passing. There is much to say apart from the colour is good for match pretty much anything and it below £10. Not forgetting it to super soft it is almost a dream. Finally these sweaty betty leggings are well out of my price range but I love so much on their website. They reversible so if the cool teal colour doesn't match the (probably only clean) top you have to hand you can wear the black ones. Super handy! I also want ALL the sweaty betty base layers which I think would be great at keeping me warm during geology fieldtrips. I've worked with Apricot a few times now and really love the brand so to see they are released an active wear collection - Apricot Life - is pretty cool. I like the simplicity of the range and I'm sure it has the same quality as the rest of the brand. I love accessorize so I've been excited to see sneak peaks of their active wear on their social media. I can't wait until it is released and I can lust over the whole collection.